This small, public garden was created in 2011 with a grant from the Big Lottery Fund, turning a neglected space between the Brunswick centre and the terrace of shops into a tranquil oasis. It is owned and managed by the Marchmont Community Garden Partnership, a collective of local voluntary organisations. The gardens host regular community events in the garden, from planting bulbs and seeds to carol singing. The award winning Marchmont Community Garden MCG) was officially opened on Saturday 3rd September 2011, with the unveiling of a plaque by The Right Honourable Frank Dobson, M.P., in the presence of invited guests and representatives of funders, partners, architects and contractors. The actor Rupert Everett, who lives nearby, planted an ‘Acer palmatum’ (Japanese Maple) tree to mark the occasion. 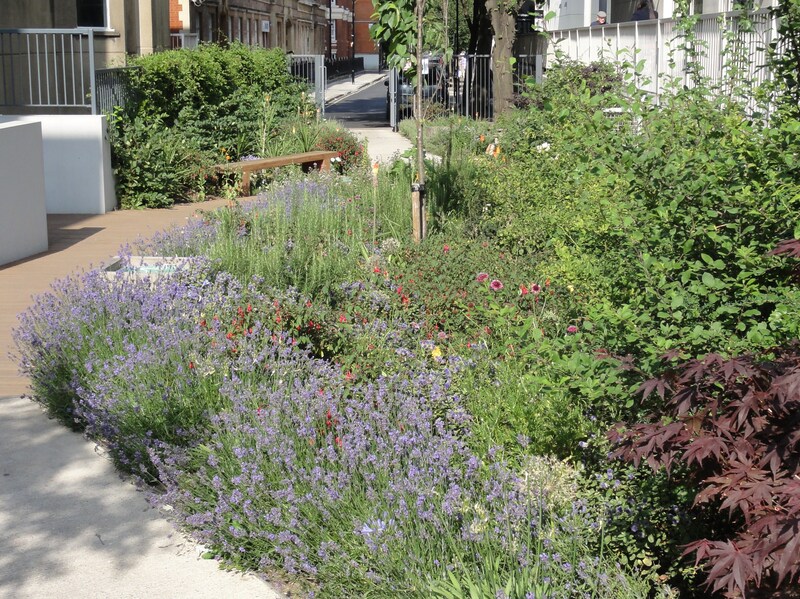 The garden celebrated its first anniversary with the award of 1st Prize for the ‘Best Community Run Garden’ in the Camden in Bloom 2012 competition on 6th September 2012 and won again in 2016. The MCG is much appreciated by its many users, which include residents of all ages, Marchmont Street shoppers, office workers on lunch breaks and visitors to the area. The MCG is so busy on sunny days that two additional benches were installed in autumn 2012. Background: In 2004/05 members of the Marchmont Association identified three major eyesores in the area, with a view to working in partnership with their respective land owners to eradicate them. The site considered to be in most need of improvement was the redundant ‘gap’ site at the north end of Foundling Court, off Marchmont Street – and after a failed attempt to develop the site for key-worker housing in 2009, we decided to create a new, beautiful, biodiverse, fully accessible, public garden, which would be owned and managed by the local community. Architects Network were appointed to work with MA on designing a scheme for public consultation. We formed a project steering group with representatives from the Marchmont Association, Kings Cross Brunswick Neighbourhood Association, Brunswick TRA, Seymour House TRA, London Wildlife Trust and Camden’s Parks & Housing departments. We secured a £100,000 grant from the Big Lottery Fund, which together with a contribution from Camden’s Section 106 ‘pot’ and a ‘peppercorn’ lease agreement on the site enabled the project to proceed. The relatively high cost of creating this garden was mainly due to the need to raise the site to a level which made the garden fully accessible between Marchmont Street and Kenton Street. Public consultation events generated much interest from local people, whose ideas were fed into the detailed design of the garden. We appointed J Murphy & Sons Ltd to implement the works, which were completed in late August 2011, on time and on budget. A new organisation – Marchmont Community Garden Partnership (MCGP) – was set up to manage and develop the garden, with the maximum involvement of local people. The MCG has benefitted from the support of a community development worker, Tony Canning, who was seconded to work with us by the London Wildlife Trust, with a specific brief to involve the community in gardening and to promote biodiversity on the site. Veolia Environmental Services generously agreed to provide a free grounds maintenance service for the first 7 years and Camden’s Parks contractor is providing site security. We are grateful to Big Lottery Fund/Groundwork UK and Camden Council for their support and to our generous local sponsors and donors whose names can be seen on the chairs and bins. Since the garden opened to the public MCGP has organised regular events to involve the community, with the help of a Sustainablity Grant from the Big Lottery Fund. The first event in October 2011 saw 1000 bulbs planted by visitors of all ages in six hectic hours during the Bloomsbury Festival. This was followed in November 2011 by the planting of a ‘Prunus Amanogawa’ (Japanese Cherry) tree by the Mayor of Camden and three local choirs singing Carols under the lights of the Christmas tree in December. The first event to be staged in 2012 was the Open Day on 14th April, when local people planted summer flower seeds, learnt about wildlife from experts and helped to build a bird box and a wood pile as habitat for stag beetles. Children were treated to free face painting, whilst the Northern Celts provided their soothing musical accompaniment and the versatile Basko entertained visitors with his special brand of circus skills, magic and balloon modelling. The biggest event of the year was the Marchmont Street Party in September, when the garden was rammed with children and families for 3 Punch & Judy shows and free face painting. 50 window boxes, complete with soil and plants, were also given away to lucky event-goers. Once again, during the Bloomsbury Festival 2012, the garden welcomed visitors to plant spring bulbs, which gave us a glorious display in spring 2013 (pictured). Photos showing the development of the garden and recent events may be viewed in the Bloomin’ Bloomsbury collection.